A visual schedule is a proven technique to manage, handle and plan time-related, resource-oriented planning data with dependencies. A visual schedule highlights conflicts and keeps the user focused on the decision-relevant data. Hence it enables corrective actions in terms of drag & drop changes to the schedule, and lets the user (and not the system) stay in the scheduling driver seat. As such, a visual schedule can become a relevant addition to a standard Microsoft Dynamics NAV implementation (you can learn more about this in a previous blog post). 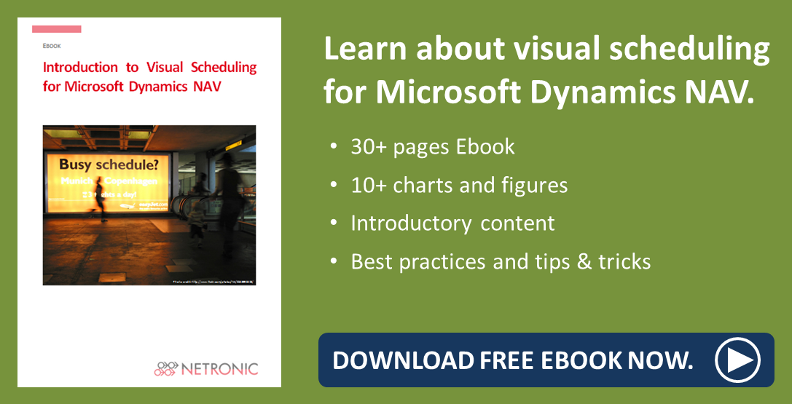 In this blog post, I want to spend more thinking on why visual scheduling is important for Microsoft Dynamics NAV users. Data growth. It is no secret that the volume and variety of both structured and unstructured data is ever increasing. Consequently, conventional databases, tables and spreadsheets have become too complex to be used immediately as decision support tools. Instead, users need and expect a graphical “condensation” of all this data to see and understand patterns and dependencies faster. Shorter decision cycles. The speed of markets’ changes has significantly grown, and hence the need to rapidly react. As consequence, the requirement to review data and make decisions changed from being a regular need in defined intervals (years, quarters, months) to becoming a frequent need. Time frames for decision making processes are shorter, and intervals are smaller. As a result, users require more information faster (see: data growth) at one glance. This also drives the need for intelligent graphs. Decentralized planning & decision making. The power to take control and to make decisions (within a given range of responsibility) has been moving down in the organizational hierarchy at rapid pace. The distribution between task workers and knowledge workers has been shifted to the knowledge workers and virtually everybody is not only expected to execute, but also to contribute to decision making and to managing. However, not every person in an organization is a planning expert and hence intuitive tools are needed to support people coping with the increased decision making responsibility. These key trends all had an obvious impact: the boom of the Business Intelligence (BI) tools happening in the past 10 years. However, as great and as smart BI tools are, they always “only” support analytics and a one-way communication between the user and the data. Of course, the user can slice and dice the data and can drill down to better understand cause and effect, but data never gets changed with BI tools. It remains static. Somewhat hidden by this BI “hype”, I also observed these general trends to cause the renaissance of the Gantt chart to happen. You ask “why”? – Well, the above discussed trends have led to a situation in which analytics and decision making have started to merge. Likewise, planning and decision making merge. Hence, especially when it comes to (time-related) scheduling data, users no longer can work with static data: they need data to be interactive, and they need a bidirectional communication with the data. This is supported by interactive Gantt charts – no longer used for long-term project planning, but for short-term visual scheduling. 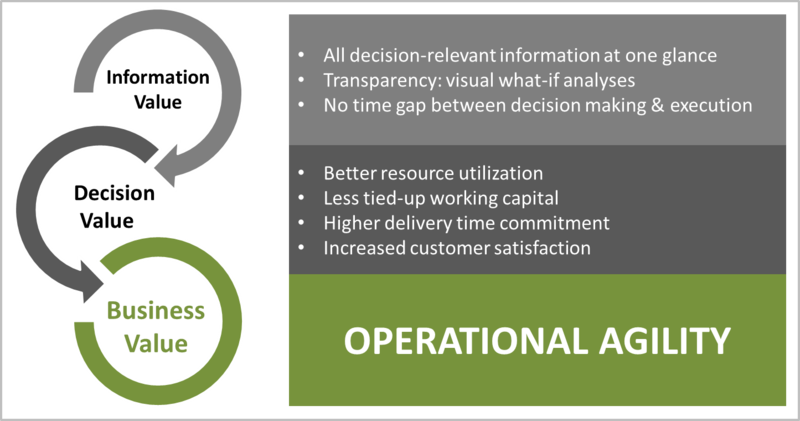 Consequently, scheduling visually is an important technique for short-term scheduling scenarios as it helps achieve operational agility. Information Value. A visual schedule in form of a Gantt chart shows all decision-relevant information at one glance: tasks, capacities, dependencies, conflicts. As a Gantt chart allows a bidirectional communication between user and data, this transparency enables schedulers to do visual what-if analyses and to compare the effects of alternative scheduling decisions. Ultimately, the user can decide for one of the scenarios and just change the schedule’s data so that there will be no time gap any more between decision making and execution. Decision Value. This transparency and the improved capability to understand cause and effect translate into a decision value. The visual schedule helps in the short-term to better utilize resources and capacities which contributes to a reduction of the degree that working capital is tied-up. In addition, the visualization of tasks, dependencies and milestones also helps making better delivery time commitments which obviously has a positive impact on customer satisfaction. Business Value. Ultimately, if you look upon Gantt charts and visual scheduling as a means to work on your short-term schedule, it will help you gain operational agility. I fundamentally believe that the described evolution of the Gantt chart has made it more important and more meaningful than ever before: It is no longer a (somewhat static) tool to visualize long-term projects and report back progress; it is a dynamic technique to visualize and manage short-term tasks with dependencies and constraints. However, for a Gantt chart to fully unveil its capability to create operational agility, you also should be prepared to explicitly accept “grey areas” in your schedule, and your scheduling process. The meaning and purpose of these grey areas, as well as specific visual schedules (such as visual jobs/project planning) for Dynamics NAV users are discussed on our new Ebook which you can download from the link below.